Osmangazi Bridge Project – Nurol Construction and Trading Co. Inc.
As per the Implementation Contract signed on 27 September 2010 between Directorate of State Highways and Otoyol Yatırım ve İşletme A.Ş., that became effective on 15 March 2013, 427 km of motorway is under construction between Gebze and Izmir. Within the scope of the project Osmangazi Bridge, with a total length of 2.682 m, has been completed and opened for public service with a governmental ceremony on 30 June 2016. Distance covered within 1,5 hours before the bridge was in service is now being covered in 6 minutes. 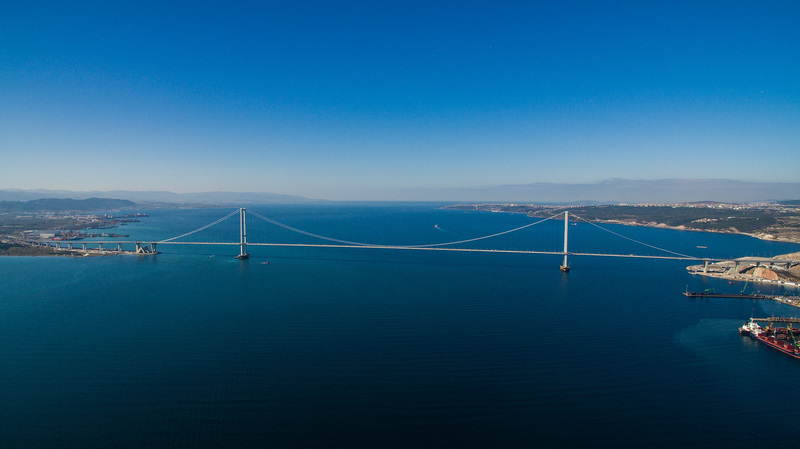 With a 1.550 m long main span, the bridge is 4th longest suspension bridge on the world.